Zombie Perfume For the ‘Preppers Will Make You Socially Acceptable to the Walking Dead! Fans of The Walking Dead know that if you cover yourself in the leftovers of friends, neighbors and family, zombies will just stroll right on by you…until it begins to rain and things go to hell real fast. 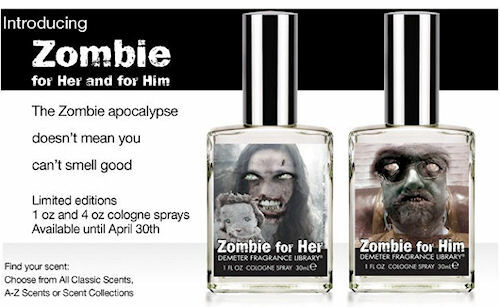 Wouldn’t it be awesome if someone would just come up with a scented…oh wait…it’s happened..
‘Zombie for Him’ and ‘Zombie for Her’. Now there’s no need to don protective wear and hack away for hours when only a butter knife is available in order to smother yourself with the innards of a hapless stranger…or a not quite zombie-apocalypse-prepped friend. Think forest floor. Zombie for Him is a combination of dried leaves, mushrooms, mildew, moss and earth. A definite must-have for any Man’s scent collection. A slightly lighter version of the Men’s fragrance with a touch of Dregs from the bottom of the wine barrel for that feminine touch. Until it suddenly rains again. Grab your shovels, shotguns and a copy of Zombieland, kids…we’re just gettin’ started. United States – In Georgia, Karl Laventure consumes everyone’s favorite new synthetic brain-melter, bath salts. In a somewhat trendy move, he strips naked and begins running around and shouting. Only this time it’s not on a causeway…it’s a golf course. Laventure was running across a golf course, naked, twirling a golf club above his head and shouting to officers who attempted to stop him, “I’ma eat you. I’ll eat you! I don’t want to eat you but I will!” Laventure shrugged off pepper spray blasts and five tasers before the sixth taser brought him under control. Go acquaint yourself with just one taser to fully comprehend what that feels like. Seriously…SIX TASERS! China – Racing to the top of the news chain, the Shanghai Daily blasts the front page with a story of a bus driver who drove his bus into an intersection and ended up blocking a woman’s vehicle. The bus driver jumps out of his bus and begins playing ‘Whack-a-Mole’ on her windshield with his fists. Terrified, the woman flees her car. Within seconds the bus driver reaches her, tosses her to the ground and begins chewing on her face. Several plastic surgeries will be needed to restore her face to ‘normal’. Russia – Body parts begin turning up in a basement and floating down the Moscow river that lead authorities to Nikolai Shadrin. Police arrive at Shadrin’s apartment to find him calmly eating stew…a stew which consists of pieces of his friend, Ilya Yegorov. Shadrin is convicted when his fingerprints show up all over the small garden shovel he used to portion out Yegorov. Shadrin nails his conviction shut when he confesses he also dined on Yegorov’s liver like a certain literary cannibal we all know (except that Shadrin seems like the type to drink his chianti from a box). It’s happening, kids. Play time and funny podcast scenarios are over. We’re suggesting taking a little prep time now to save yourself some heartache later because you forgot to snag some ammo for your boomstick and find that the only shovel-like object you own is a rubber spatula. 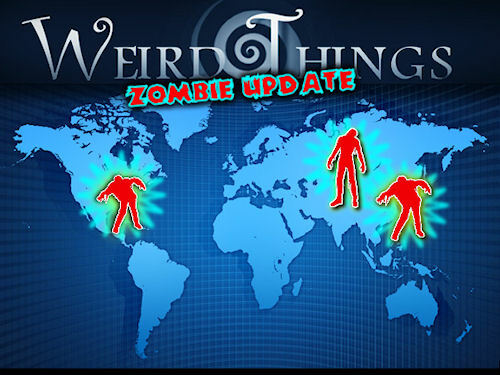 Trust WeirdThings to keep you informed on any more zombie-like activity. Have a safe holiday and watch your face. 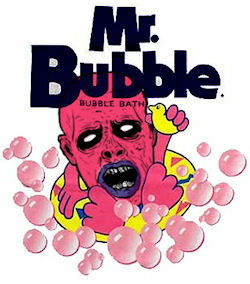 Bath-Salt Zombie Activity in New York! We’re not out of the woods yet, kids. ‘Bath Salt Zombie’ activity is now being reported in central New York! This lovely lady won a free ride in a well-cushioned van to the local hospital for mental evaluation. Just a little while later in a not-so-zombie-like, but still bath-salt fueled, incident, 20 year-old Aubrey Vallis had ripped a door off its hinges and was busy punching a car in a driveway when police busted him for criminal mischief. Anyone else find themselves a little nervous around the bath section of your local drugstore lately? Every time we laugh about a zombie apocalypse another incident bites our lips right off our smiles and reminds us that we should probably stop laughing and start grabbing shovels. This time around what began as a domestic disturbance call from neighbors turned into something that’s getting a little too familiar right now. The ‘zombie’ in this case is 43-year-old Carl Jacquneaux. Todd Credeur, the victim who knew Jacquneaux, was outside working in his yard when we was attacked by Jacquneaux. Credeur stated that he was shocked when Jacquneaux bit him on the face. Credeur was able to spray wasp pray on Jacquneaux’s eyes and escape the attack. Carl Jacquneaux wasn’t quite finished. He jumped into his car and headed to another friend’s where he that friend at knife-point and snagged a handgun. That was when the law caught up with him. 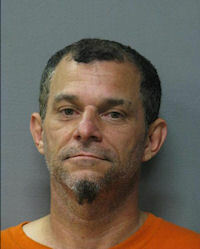 While no one’s really sure what set Jacquneaux on his zombie-like attack on Credeur, one of the victim’s friends stated that he was, in fact, under the influence of something at the time. Anyone want to venture to take you know, a big stab in the dark about what the victim’s friend claims he might’ve been taking? Posted in Zombie, Zombies | Comments Off on Zombie Attacks Continue! He spent his time with zombies. That’s the excuse for a man claiming to be Zulu folk singer Mgqumeni, who died and was buried in 2009 on why he hasn’t be around. The would-be Mgqumeni says he’d spent the intervening years amongst the undead before freeing himself and returning to the world of the living. The man has now been brought to a local court and authorities could exhume Mgqumeni’s remains to test them against his alleged incarnate. 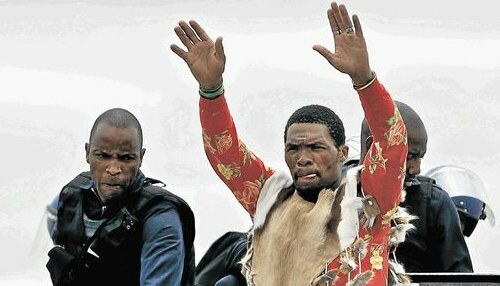 They are going to test his DNA against Mgqumeni’s and have warned him that he will be charged with fraud should they not match up. 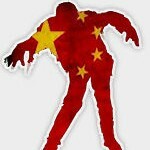 Upon hearing of his return, many of the singers fans have flocked to see their possibly resurrected idol. Above is a picture of Mgquemi now after surviving the afterlife and below is a picture before. 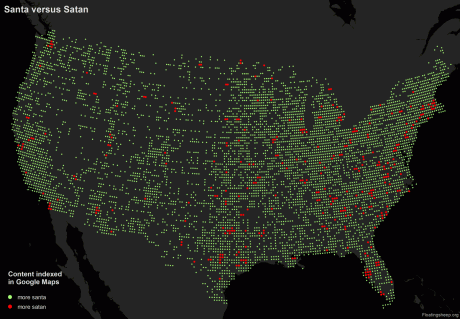 The University of Oxford’s Internet Institute has analyzed Google search patterns and discovered that there are places in the United States where there are more people searching for zombies and satan than for Santa Claus. Check out the Satan cluster around Tampa Bay; I am going to have to start watching my neighbors a little more closely. You can download the data here and find your own patterns. While filming the fifth installment of the Resident Evil franchise 16 zombie extras fell from a platform. Emergency responders, who were unaware of the costumes, were taken aback when brought to the pile of mangled faces, discolored skin and peeling flesh. Paramedics responded to the call from Cinespace Film Studios around 8 a.m. to find what appeared — thanks to Hollywood special effects makeup — to be people who had suffered some untold catastrophe. “I could see the look on the first paramedic, saying ‘Oh my God,'” Toronto emergency medical services Commander David Ralph said with a laugh. Toronto Police Sgt. Andrew Gibson said responders quickly figured out which zombies were injured and which were just in character. “It did kind of catch us off guard when we walked in,” he said. Thankfully, none of the injuries were life threatening and all of the zombies will live on to stagger another day. The Leicester City Council is “not ready” for a zombie attack and a concerned citizen forced them to admit it using the Freedom of Information Act. The CDC recently released one here in the U.S., but it could use some work. 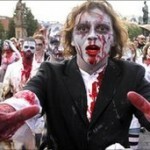 “A worried member of the public has forced Leicester City Council to admit it is unprepared for a zombie invasion. The “concerned citizen” said the possibility of such an event was one that councils should be aware of. Can you please let us know what provisions you have in place in the event of a zombie invasion? Having watched several films it is clear that preparation for such an event is poor and one that councils throughout the kingdom must prepare for. It’s called the Safe House. You get in via a retractible concrete drawbridge. All guests must be buzzed in from a safety zone before entering the home itself. It is the perfect humble abode for the young family terrified of being torn apart by zombies. Built between 2005 and 2009, the house features Rubik’s Cube-type movable parts and folds in on itself completely at the end of the day to seal against outside threats. “Every day the house acts in a similar way — it wakes up every morning to close up after dusk,” says architect Robert Konieczny of KWK Promes. Wait? It’s on the outskirts of Poland? Even when it comes to a zombie holocaust you can’t violate the three rules of real estate: location, location, location. 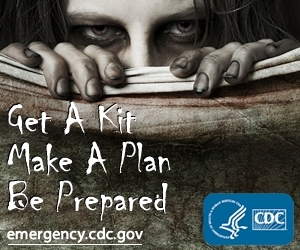 The CDC has published a plan in case of a zombie outbreak. I am disappointed that their emergency kit does NOT include any weapons at all. That does not sound like a valid plan to me and I will definitely be upgrading the proposed kit with some additional items. With apologies to John Coulton, there really isn’t much work being done in the niche genre of rock music from the perspective of a zombie. 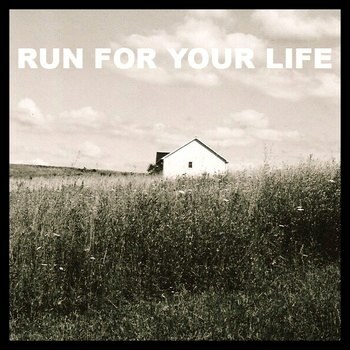 Enter Aaron Stoquert, an NYC folk singer/songwriter whose five-track EP Run For Your Life does just that with great effect. If you are into melodic, creepy, haunting tunes heralding the cold inevitable reality of cannibalistic demons posing as family members tearing apart society one limb at a time, press play immediately. Head to Aaron’s site for the rest and we encourage you purchasing. 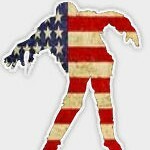 Voting is still open for the 2010 Zombie Safe House Competition. Choose between the 40 Day Z POD, the SS Huckleberry, Mountain Getaway, and Sears Roebuck 003-b. I am personally rooting for the SS Huckleberry because “Mobility = Security”. 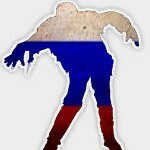 According to the upcoming National Geographic documentary The Truth Behind Zombies, we may be a few mutations or lab experiments away from a full scale zombie apocalypse. 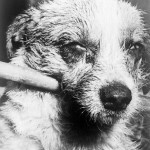 If the rabies virus, which can cause violently mad behaviour, was combined with the ability of the flu virus to spread quickly through the air, it might be the right combination for our very own disaster. “All rabies has to do is go airborne, and you have the rage virus” like in 28 Days Later, Max Mogk, head of the Zombie Research Society, says in the documentary. While it is not possible for two completely different viruses to hybridize naturally, the possibility exists that they could be genetically modified and combined in a lab. Also, Zombie Research Society! You are currently browsing the archives for the Zombies category.